Vietnam is unbelievably picturesque. At least here in Hanoi, there are loads of women still wearing those pointy straw hats, and presumably not just because they know how much the Western tourists enjoy all this authenticity. 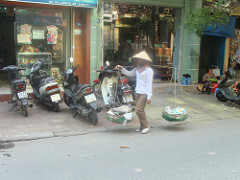 The streets are also filled with women carrying baskets suspended on the ends of traditional yokes, such as the one pictured at right. The cognitive dissonance inspired by watching these women weave in and out of the motorbike traffic offers a slight thrill to camera-happy tourists like me. The figures I get mesh roughly with Vietnam's official per-capita GDP of about $800 a year. Many things such as real estate are cheaper, here, of course, so that figure isn't quite an accurate gauge of living standards. Purchasing power parity calculations put the actual standard of living at somewhere around $4,000 a year. It's hard for an American to imagine that sort of grinding poverty; it is a material standard of living lower than that enjoyed by the average homeless person back home (though of course homeless people suffer many other maladies that do not afflict the ordinary Vietnamese). One way to think about it is this: the economic types we've met with repeatedly state, as if it were not particularly interesting, that the average person in Vietnam spends the majority of their budget on food. That figure in the United States, even for poor families, is less than 20%--and that to procure a diet that is lavishly oversupplied with calories and protein. 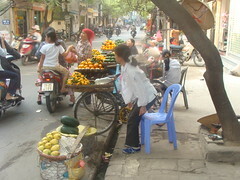 The sight of people carrying goods in traditional ways, selling produce off the backs of bicycles, looks terribly romantic. I walked past two tourists today who were agreeably chatting about how beautiful and sustainable it all is. But it's hard to find anything romantic about human beings using themselves as mules.